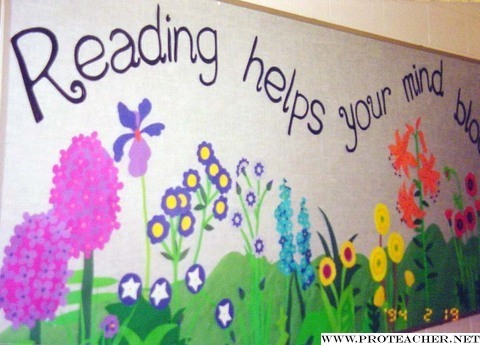 Reading Helps Your Mind Bloom! This bulletin board is located in the hall outside the school library. For spring last year, I used Lois Ehlert's picture book entitled, Planting a Rainbow as my inspiration. It was completely made out of construction paper. Each flower was constructed by cutting each piece, no matter how small or big, out of various colored paper. I used a hole punch for the brown "freckles" in the tiger lilies and the centers of the hyacinths. I then put the flower pieces together using a glue stick and stapled them to my bulletin board using green bulletin board paper as a background along the bottom. The lettering was made by enlarging a pretty font from my computer. I printed out my caption on the largest size, then enlarged the letters on the copier and used them as a stencil. The best compliment I had was from a kindergartner who very enthusiastically exclaimed, "Our teacher just read that story!"